A woman had to have her jaw reset after dislocating it while eating a triple-decker burger. 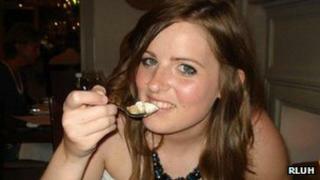 Nicola Peate, from Ormskirk, Lancashire, injured herself while eating at Liverpool's Almost Famous restaurant on 8 August. Ms Peate, 25, who has a syndrome which makes her joints unstable, was treated at the Royal Liverpool University Hospital the next day. She said she would be "more conscious of the size of food in future". Emergency department clinical director Kathryn Clark said dislocations such as Ms Peate's were "rare". "I hope that in future, she takes more care when eating over-sized burgers," she said. She added that "if food is too large, we would recommend cutting it into more manageable chunks". Ms Peate said she had been in pain after trying to eat the burger but did not realise the extent of the injury until the next morning. She said: "I didn't think I'd dislocated it - you don't expect it to happen eating a burger, but I tried to eat it with a knife and fork and couldn't. "I couldn't open my mouth fully - it felt like I had cramp in my tongue, then I started to get an earache and a headache. "The next morning, I felt really, really ill. The whole side of my head was hurting, then it started to feel like it was in my jaw and I knew I'd dislocated it." Ms Peate has Ehlers-Danlos syndrome, which means she has hyper-flexible joints that are prone to dislocation, so she said she knew to go to hospital for treatment. "The minute it went back in, it was like turning a tap off in my head - all the tension just went," she said. A spokeswoman for the restaurant said they would be happy to have her back to "enjoy a burger on us [though] we'd recommend something a bit more manageable". "We all had a massive cringe at the thought of someone's jaw being popped back into place, but we're all really glad Nicola is OK," she said.